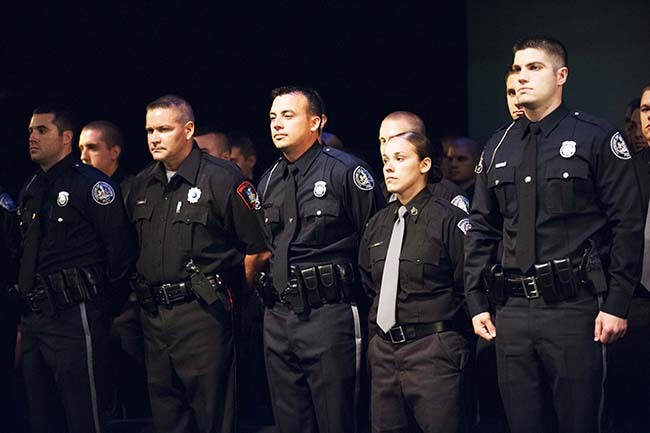 Fifty police cadets of Classes 1303 and 1401graduated from Montgomery County Community College’s Municipal Police Academy on July 16 during a ceremony held at the College’s Science Center Theater, 340 Dekalb Pike, Blue Bell—a fitting number as the College celebrates its 50th anniversary this year. FBI Special Agent Scott A. Duffey and District Justice Paul N. Leo, who both teach at the academy, served as the keynote speakers. Duffey told the cadets and audience members the jobs for today’s police officers are 24/7. “You not only have to combat crime and protect the public, but you need to find innovative ways to reduce crime. . . you must be both proactive and ready to react,” he said. Leo similarly advised the graduates to think creatively as well as proactively. “You must think outside the box, not that you will trample any of the rights under the Constitution, but you must realize there are many ways to solve a problem,” he said. The Valedictorian for Class 1303, Lt. David Vernacchio, reminded his classmates about three important concepts for all police officers to remember: professionalism, integrity and family. Academy Deputy Director Jude T. McKenna presented the James R. Miller Marksmanship Awards to Staff Sergeant Steven Bauman (1303) and to Christopher Sheffer (1401) and the Spirit of Distinction Awards to Josh Taormino (1303) and Sergeant Brendan O’Connor (1401). During the ceremony, Karen and John McGowan IV presented the Chief John J. McGowan III Memorial Scholarship in the amount of $3,500 to Lauren Hart, North Wales. The scholarship honors East Norriton Police Chief John McGowan, who died in a motorcycle accident in 2010. Hart, 23, graduated with a bachelor’s degree in Criminal Justice from Delaware Valley College and then enrolled at the Police Academy. She has done internships with the Montgomery County Detective Bureau, Upper Dublin Police Department and the Department of Homeland Security. She started her new job as an officer with the Whitemarsh Township Police Department on July 21. The 33 graduates of Class 1401, who attended the 22-week full-time program, are Joshua Bills (Pocono Summit, Pa.), Eric Blood (Philadelphia), Andrew Burrows (Doylestown), Ralph Burrows (Bellingham, Wash.), Raymond Clayton (Philadelphia), Brett Cortis (Boyertown), Kyle Crawford (Collegeville), Thomasz Czarnuszewicz (Yardley), Peter Gubicza (Holland, Pa.), Elliott Guffey (Royersford), Justin Harris (Philadelphia), Lauren Hart (North Wales), Justin Johnson (Harleysville), Kevin Junod (Glenside), William Kane (Harleysville), Matthew Maciejewski (Buffalo, New York), Kevin Marvill (Ambler), Greg Meinhardt (Harleysville), Lauren Mergen (Harleysville), Brendan O’Connor (Conshohocken), Nick Ratschof (Southampton), Imran Raza (Warrington), Shaun Roberts (Fallsington, Pa.), Erich Rumsey (Doylestown), Gregory Sedgwick (East Norriton), Christopher Sheffer (Bridgeport), Robert Steck (Warminster), Adam Szewczyk (Lansdale), Vincenzo Tucciarone (Perkasie), Zachary Waltman (Feasterville), Douglas Wang (Levittown), Greg Waters (Churchville) and Joel Williams (Horsham). The 17 graduates of Class 1303, who attended the 42-week, part-time evening program, are Brian Armstrong (Lansdale), Steven Bauman (Sellersville), Michael Cantrell (King of Prussia), Albert Chan (Philadelphia), Carlito Cortez (Richboro, Pa.), Brad Craig (Conshohocken), Anthony Long (Bethlehem), Lora Martin (Bethlehem), Brandon Martinez (Philadelphia), Jonathan Matthews (Horsham), Randall Pompei (Quakertown), Brittany Rosenfeld (Hatfield), Joshua Samuels (Quakertown), Alana Stanziano (Harleysville), Josh Taormino (San Jose, Calif.), Michelle Williamson (Levittown) and David Vernacchio (West Norriton). Montgomery County Community College, in conjunction with the state training commission, operates the Municipal Police Academy at the Montgomery County Public Safety Training Campus, 1175 Conshohocken Road, Conshohocken, PA 19428. The Academy has been the training ground for approximately 3,800 cadets with a consistent graduation rate of more than 90 percent. The 800-hour curriculum allows successful students to articulate up to 15 credit hours toward an associate’s degree in Criminal Justice. 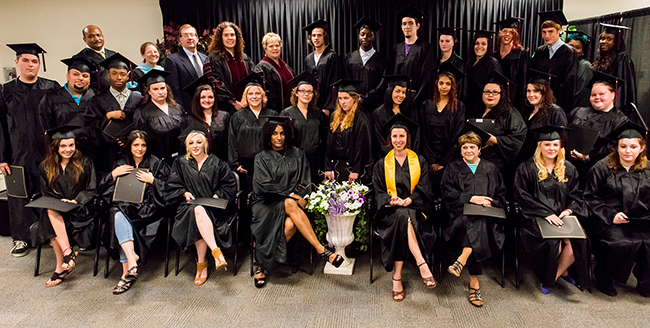 Forty-five students earned their General Education Diplomas (GED) during Montgomery County Community College’s annual graduation ceremony on June 5 at the West Campus in Pottstown. 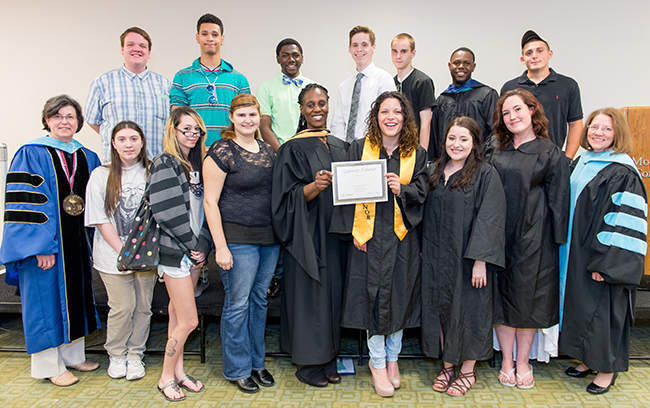 The graduates were part of the College’s rigorous five-week program that is among the most accelerated in the state. According to GED Program Coordinator/Instructor Raymond Ricketts, 860 students have completed the program since its inception in 2006. To learn more about the College’s GED program or GED testing services, visit mc3.edu/adm-fin-aid/ged. Eight students from Montgomery County Community College’s Gateway to College Program earned their high school diplomas this spring after completing the requirements necessary to graduate from their respective school districts. Gateway to College is a national network designed for young adults ages 16-21 who are at risk for not completing high school. One of only 43 Gateway to College programs in the country, Montgomery partners locally with 16 area school districts and the Montgomery County Workforce Investment Board (WIB) to help increase high school—and ultimately college—graduation rates. Spring 2014 graduates include Meghan Benson, Wissahickon; Ne’Cole Casalena, Phoenixville; James Hanible, Pottsgrove; Erika Knappenberger, Souderton; Justin Leamy, Pottsgrove; Jose Ortiz Rivera, Hatboro-Horsham; Carlas Rich, Phoenixville; and Rachel Voltz, Upper Merion. All of the graduates plan to pursue post-secondary education, and at least six will attend Montgomery in the fall. Ne’Cole Casalena, Phoenixville High School, was selected as valedictorian. One of those graduates, Ne’Cole Casalena, Phoenixville High School, described her journey in rhyming lyrics, speaking as class valedictorian. “And I want to thank everyone but me, cause without you, I don’t know where I would be. Where I am, as a person, they are life lessons, not a burden…If I could, I wouldn’t change a thing, cause out of 18 years, this was the best spring,” she recited. In only its first year at Montgomery, the Gateway to College program has grown from 21 students in the fall to 52 this spring. At full capacity, the program will serve up to 150 students annually. Fifteen of Montgomery’s students were recognized as Gateway Achievers by the Gateway to College National Network. Students include: Jose Ortiz Rivera from Hatboro-Horsham; Gustavo Ascencion from Norristown; Ne’Cole Casalena and Laura Krueger from Phoenixville; Brianna Gagliardi, Marcus Gordon and Anthony Romano from Pottsgrove; James Hanible from Upper Merion; Christopher Anderson, Shane Bowman, Jelani Crosby and William Dobnak from Upper Moreland; Shaquilla Anderson from WIB; and Meghan Benson and Emahnie Holmes from Wissahickon. Fifteen of Montgomery’s students were recognized as Gateway Achievers by the Gateway to College National Network. The College also recognized spring Gateway students for their achievements. William Dobnak, Upper Moreland, and Laura Krueger, Phoenixville, were recognized as Foundation (first term) Students of the Semester. They also earned the highest GPA among the College’s Gateway students along with Jelani Crosby, Upper Moreland. Marcus Gordon, Pottsgrove, and Rachel Voltz, Upper Merion, were recognized as Transitioned (second term) Students of the Semester. Perfect Attendance went to Shane Bowman, Upper Moreland; Anthony Romano, Pottsgrove; and Thomas Rosa, of Plymouth Meeting. Rosa was also recognized as Most Courageous, along with Paige Trump, Pottsgrove. Romano was recognized for Change of Heart, along with Jose Ortiz Rivera, Hatboro-Horsham. Brianna Gagliardi, Pottsgrove, and Julian Richardson, WIB, earned Most Improved, while Amber Keyes, Norristown, and Faith Owens, Pottsgrove, earned Rising Star awards. Additional awards included Perseverance, given to Nicole Snyder, Upper Moreland, and Dejah McMillan, Pottsgrove; and Most Determined, given to Gustavo Ascencion, Norristown, and Keara Hyden, Phoenixville. Students begin the Gateway to College program with a Foundation semester, during which they take classes in reading, writing, math, and college skills as part of small learning communities. After successfully completing the Foundation term, participants transition into one of the College’s academic programs, earning college credits while completing high school requirements. Throughout the program, students are advised and mentored by Gateway Resource Specialists Lori Davidson and Esau Collins. They also actively engage in college and community service. Partnering school districts include Boyertown, Cheltenham, Daniel Boone, Hatboro-Horsham, Norristown, Perkiomen Valley, Phoenixville, Pottsgrove, Pottstown, Souderton, Spring Ford, Upper Dublin, Upper Merion, Upper Moreland, Upper Perkiomen, Wissahickon and the Montgomery County Workforce Investment Board. 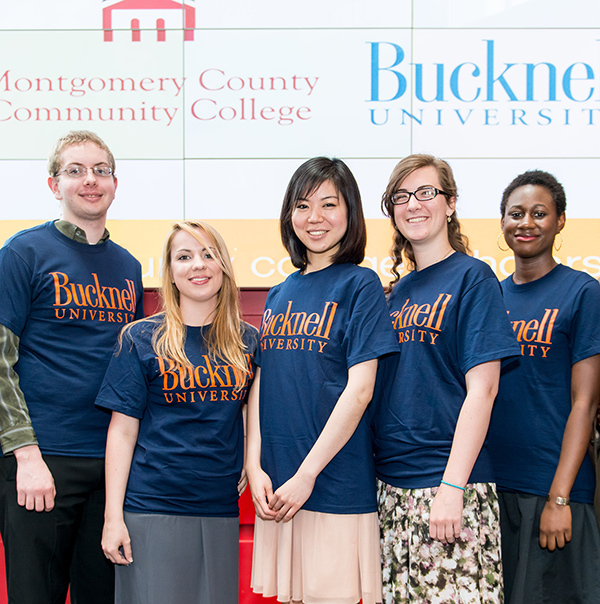 Eleven Montgomery County Community College students soon will be attending Bucknell University in Lewisburg, Pa., this summer and fall through the Bucknell Community College Scholars Program. Six of the students—Margaret Crush, North Wales; Summer Grenyion-Smith, Ambler; Jeremy Lowery, Gilbertsville; Yinquing (Lindsay) Pan, Blue Bell; Brian Richmond, Gilbertsville; and Mary Colleen Watson, Phoenixville, will participate in Bucknell’s Summer 2014 Residency Program. During the summer program, selected students enroll in two courses and work with student and faculty mentors for six weeks. The program is free for the students and includes tuition, room and board and books. Participating students then have the opportunity to apply to Bucknell in 2014, and if accepted, they will transfer to the university with junior status on full-tuition scholarships. Five of the students who participated in last year’s summer program— Lydia Crush, North Wales; Brian Hipwell, Cheltenham; Mallory Murphy, West Lawn; David Reedel, Roslyn; and Ken Stephon, Doylestown—were selected to transfer to the university in the fall as juniors with full-tuition scholarships from Bucknell. Initially funded for four years by the Jack Kent Cooke Foundation, the Bucknell Community College Scholars Program enables high-achieving, low-income community college students to complete their undergraduate education at the university. According to Mark Davies, Bucknell’s Assistant Vice President for Enrollment Management and the liaison for the Community College Scholars Program, the university is committed to continuing the program, which it has funded for the past four years. 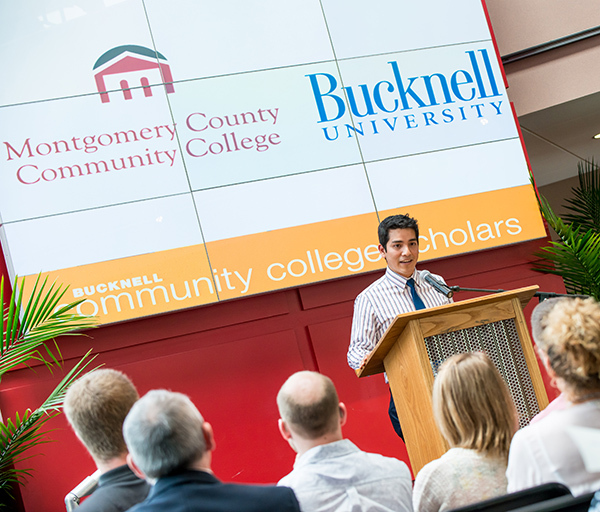 During an annual scholarship reception on May 14, Montgomery and Bucknell alumnus Oscar Beteta spoke about how the program enabled him to reach his goals. After earning his associate’s degree at Montgomery County Community College, he transferred to Bucknell on full-tuition scholarship and graduated with a bachelor’s degree in Chemical Engineering. He now works as an engineer at Air Products and Chemicals. Inc. Beteta was part of the first summer cohort to participate Bucknell Community College Scholars Program. 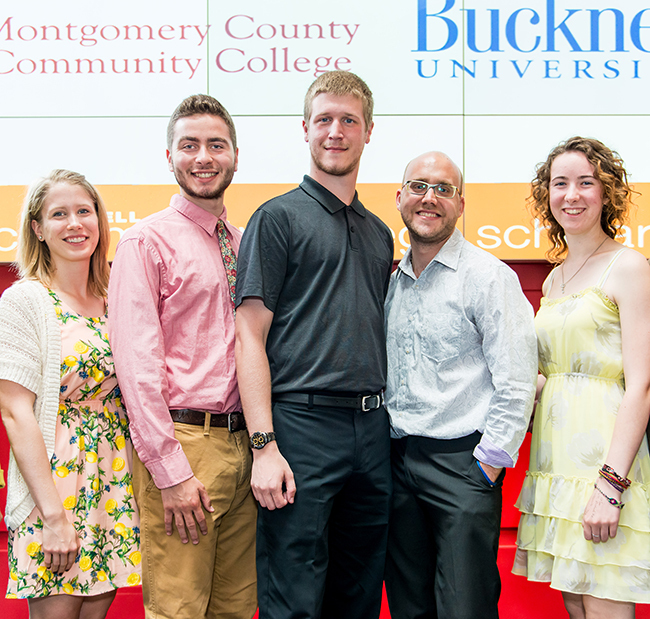 Montgomery County Community College has participated in Bucknell’s Community College Scholars Program since 2006. Including this year’s scholars, a total of 54 students attended the summer residency program, and, including this year’s graduates, a total of 36 students transferred to Bucknell on full-tuition scholarships. Bucknell’s program extends to five community colleges: Montgomery County Community College, Garrett College, Lehigh Carbon Community College, Community College of Philadelphia and Harrisburg Area Community College. Brittany Harding of Hatboro-Horsham School District completed her high school requirements and received her diploma. 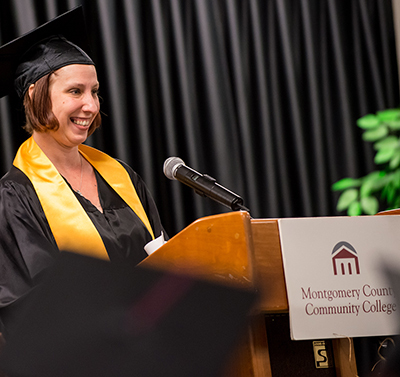 Montgomery County Community College’s Gateway to College Program hosted its first Awards and Graduation Ceremony recently at its Central Campus in Blue Bell. After participating in the Gateway to College program for the fall semester, Brittany Harding completed her high school requirements and received her diploma from Director of Curriculum Dr. David Weber on behalf of the Hatboro-Horsham School District. It was a proud moment for Harding and her family. 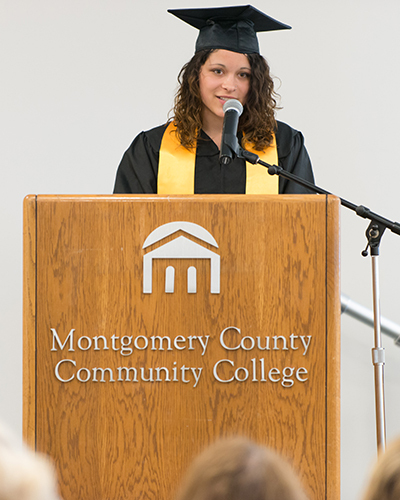 Now that she has completed this first milestone in her educational journey, Harding looks forward to taking college courses during the 2014 Spring semester at Montgomery County Community College. She plans to get her associate’s degree in Mathematics and then get her bachelor’s degree so she can be a math teacher. Harding is one of 21 students in MCCC’s first Gateway class that started in September 2013. MCCC is only 1 of only 43 higher education institutions in the country (and one of only two in the state) selected to participate in this program, which offers at-risk high school students a second chance to earn their diplomas and pursue college degrees. To date, 13 school districts and the Workforce Investment Board have partnered with MCCC, creating one of the largest collaborations in the Gateway program. “My Gateway students are some of the most resilient and capable young people I have had the pleasure of supporting on their academic journey. Many are faced with incredibly difficult life circumstances yet they consistently attend school, participate in a rigorous learning environment and meet the expectations of the program. While this program is designed for students who are at-risk of not completing high school, my students prove that if given the opportunity to excel they can and will rise to the occasion. They are dreamers who have found a dreaming space at the MCCC GtC program,” said Keima Sheriff, MCCC’s Gateway program director. In addition to celebrating Harding’s milestone achievement, Sheriff, along with Gateway Resource Specialists Lori Davidson and Esau Collins and MCCC Vice President for Student Affairs and Enrollment Management Kathrine Swanson, recognized students for their achievements. Fourteen students completed the Foundation Semester portion of the program and will now transition as mainstreamed college students and continue taking classes while learning to work more independently. The students with the highest GPAs were Brittany Harding (Hatboro-Horsham School District) and Dejah McMillan (Pottsgrove School District). Carlas Rich (Phoenixville Area School District) and Khary Harris (Norristown Area School District) earned the Most Improved (GPA, attendance and attitude) awards. Marcus Gordon (Pottsgrove School District) and Rosemary Lux (Norristown Area School District) received The Most Determined awards. Isaiah Heverly (Phoenixville Area School District) and Peter Edwards (Norristown Area School District) received The Change of Heart (improved approach to learning). Anthony Hall (Phoenixville Area School District) and Amber Keys (Norristown Area School District) earned The Most Courageous awards. The Perfect Attendance award was presented to Dejah McMillan. The overall Gateway to College award (GPA, attendance and participation) was presented to Rachel Voltz (Upper Merion School District). Several students were recognized as Gateway Achievers (average GPA of 2.5 or higher): Dejah McMillan, Faith Owens, Anthony Hall, Marcus Gordon, Rachel Voltz, Rosemary Lux, Amber Keys, Khary Harris, Brittany Harding and Yasmin Rich. The 14 students who completed the Foundation Semester and are transitioning to mainstream college courses are: Khary Harris, Amber Keys, Rosemary Lux, Yasmin Rich, Michael Sharky, Nicole Snyder, Rachel Voltz, Marcus Gordon, Anthony Hall, Isaiah Heverly, Alexandra Johns, Dejah McMillan, Faith Owens and Carlas Rich. 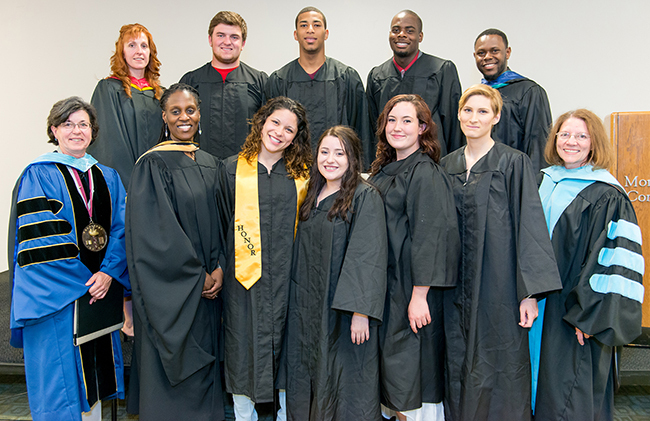 Recipients of the Gateway to College Achiever Awards included (front row, from left) Dejah McMillan, Faith Owens and Brittany Harding and (back row, from left) Rosemary Lux, Khary Harris, Anthony Hall, and Rachel Voltz. Standing with the group are MCCC Vice President for Student Affairs and Enrollment Management Kathrine Swanson (left) and Gateway Program Director Keima Sheriff (right). Missing from the photo are Marcus Gordon, Amber Keys and Yasmin Rich. Family needs drive Tracey Twitty, 32, of Barto. The proud, loving mother of five beautiful children became an advocate for autism awareness when her middle son was diagnosed with mild autism at the age of three. And she wanted to enter the medical field since her mother was implanted with a pacemaker when Twitty was seven years old. “I became fascinated with cardiology,” she said. Twitter returned to Pennsylvania when she learned that her father was sick and needed her at home. “I wanted to continue my education, so I decided to look into schools [in Pennsylvania], and what I had found was that Montgomery County Community College had a really competitive program. After talking to Diana McFadden [academic advisor at West Campus], I decided that the College was where I wanted to go,” Twitty said. Twitty is enrolled in the Medical Assisting Certificate Program and anticipates earning her certificate in August. After that, she plans to continue her education at Montgomery County Community College, first to achieve her Phlebotomy certificate and, ultimately, her Registered Nurse certification. At Montgomery County Community College, Twitty is a member of the Medical Assisting Club and a student representative on the Medical Assisting Advisory Committee. In that capacity, she was asked to travel to Harrisburg on April 9 for Lobby Day, an annual day when a contingent of community college students travel to the state capitol to speak with legislators. She brings to the state capitol more experience, more passion, and more reasons for advocacy than most of her community college student peers. When Twitty walked with her classmates in May, it was with the knowledge that her children and her parents are bursting with pride and that she is the role model for her children that she hoped she could be. She is already the first member of her immediate family to attend college. Although she did not intend on becoming involved in Montgomery County Community College’s chapter of Phi Theta Kappa (PTK) honor society and Phi Beta Lambda (PBL) business organization, Quanzella Butler made use of every campus resource to guarantee that she has a thriving career upon graduation. Butler, of Pottstown, graduated in May with a degree in management and high expectations of starting her own business in the future. “The most rewarding aspect of my major is learning about different aspects of business from supervision, business law, business ethics and introduction to speech, which gave me confidence to be more than just a student,” Butler shared. She plans on transferring to Albright College to pursue a degree in business management. Butler, a mother of 10, is not a stranger to juggling multiple tasks and goals at once. “I have learned to balance everything,” she said. She also has previous experience in her desired field, which included managing a tax office for two years. Phi Beta Lambda first caught Butler’s interest when a professor recommended the business oriented student organization. “I was really interested in getting involved, because it seemed like a great club for business students,” explained Butler. It was after she received a 4.0 GPA and made Dean’s List that Butler opted to become a member of PTK, which recognizes achievement among two-year college students. “I was determined to become a part of the PTK, it was a personal mission for me,” she expressed. Throughout her involvement in these organizations, she participated in fundraising efforts, promoted Phi Beta Lambda events and developed her leadership skills. “Some of my favorite memories involve giving back to MCCC, which will help students after I am gone,” shared Butler. The opportunities she encountered while engaging in community service and interacting with others was also a large benefit that she came across. When she’s not involved with PTK and PBL, Butler also holds the position of secretary in the book club and is involved in the student challenge. “Being involved in clubs gave me a sense of belonging to something that is meaningful and a sense of importance,” she said. Additionally, she is the co-leader for a Girl Scout troop outside of MCCC. Butler’s support system includes her fiancé, children and Assistant Professor of Speech Communication Rob Novelli. In her free time, she enjoys sewing, camping, gardening and reading.